We have fished the last 3 days including a 6 hour open boat trip Thanksgiving morning where we caught 4 stripers but two of them were shorts and released. 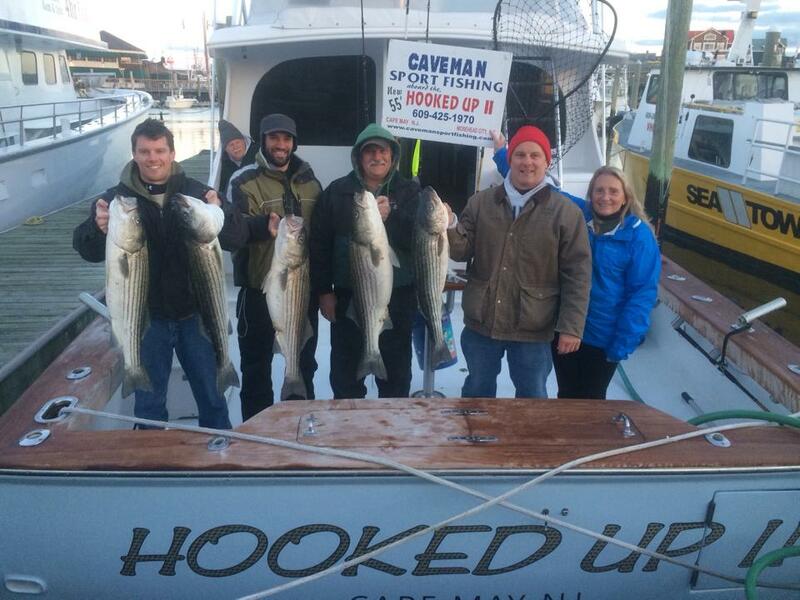 On Black Friday we got 5 nice ones with the Karl Scherzberg family from Coopersburg, Pa. On Friday’s trip with the Scherzberg family we stopped on the way back from up at the northern location we have been fishing and found some nice keeper stripers off North Wildwood. All in all, it was tough fishing with the wind and cold but the crew hung in there and managed to put a decent catch together. They were a hardy crew! We went back to the same location on Saturday’s trip where we had the late afternoon bite on Friday afternoon but the excessive boat traffic probably contributed to the slow bite. We had our lines in before daybreak on Saturday hoping the stripers were still around and feeding but only managed 3 striper bites all day. As of this morning we will be out every day the weather permits through at least the second week of December. We cancelled today (Sunday) with the strong SW winds down here but plan on going tomorrow. Things sure have changed for us this season striper season as I never thought I would be running 20 plus miles up the coast to catch stripers but on many of our trolling trips that is exactly what we have done so far this season. Things changed for us starting on Saturday’s trip as we were able to find some nice stripers closer to Cape May mostly on stretches and shad umbrella rigs. We are now seeing some shorts showing up along with an occasional Bluefish which up until this past weekend we had not seen any gators locally this fall. Last season we trolled on almost all our trips within 10-12 miles of Cape May and were able to limit out on quite a few trip easily by 8:00-9:00 am but this fall it has been much tougher fishing over the last week or so for us. We have been trolling mostly shad umbrella rigs, Mojo’s and stretches with bunker being what the stripers are feeding on. We got a late start this season trolling along the beach front and missed out on some excellent fishing as we were waiting for the chunk bite to take off and it never did. As I have mentioned in a previous report many of our customers prefer chunking over trolling but all indications it looks like the chunking season is definitely over and with the exception of some large stripers caught a few weeks ago there sure was not much of a fall season this year in the Delaware Bay. Last year we had some great trips the first few weeks of December and hoping we can duplicate that this year.